GuardAir Ultra Series Bench-Top & Extended Reach Air Guns Provide Hard to Reach Compressed Air Maintenance For Automotive, Manufacturing, Commercial, and Other Related Applications. 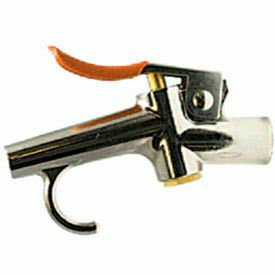 These air guns are made of aluminum, iron, brass and other materials for lasting strength and durability. The zinc alloy venturi nozzle provides high intensity pressure for improved maintenance. Units feature long, short, or wide triggers for ergonomic handling and operation comfort. Features a low noise output for reduced work resonance. Available styles include Blind Hole Gun, Force 5 With Venturi Nozzle, Hydroforce Power Washer, Inforcer With Venturi Nozzle, and more. Air usage (SCFM) ranges from 8 to 185. Noise output (DBA) ranges from 93 to 121. Thrust (LBF) ranges from 0.1 to 13.5. Meets OSHA standards. Dimensions vary per model. 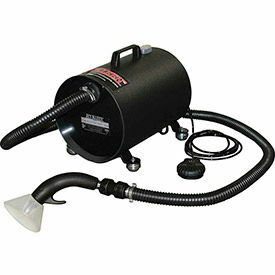 Blow Guns Provide High Energy Compressed Air For Maintenance, Automotive, Repair, and Other Related Applications. These guns include a convenient trigger handle that releases a steady stream of air to clean hard to reach areas. Units are made of high quality materials for lasting strength and durability. Some models include a grip for added comfort and user control. Optional tips create a tight seal for cleaning out oil passages and fuel lines. Dimensions vary per model. GuardAir Gun Vac® Series Kits Support Easy Maintenance For Automotive, Commercial, Industrial, and more. These gun vacuums are powered by standard shop compressed air with no electric motors to prevent burn out. The high filtration collection bag attaches to the rear of the vacuum allowing convenient waste disposal. The all metal construction is both strong and durable for years of lasting reliability. The hanging eyelet provides convenient, out of the way unit storage. Features contoured grip for user comfort. 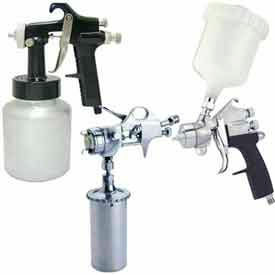 Available styles include Flexible Gun Vac Kit, Gun Vac Deluxe Kit, and Gun Vac Kit. Dimensions vary per model. 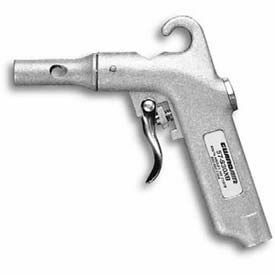 GuardAir Lazer® Series Air Guns Provide High Pressure Air Maintenance For Automatic, Commercial, Manufacturing, and Other Related Applications. The brass venture muzzle and soft, over-molded rubber trigger ensure added comfort for extended work periods. The air guns feature an all metal construction for lasting strength and durability. Extended reach units allow hard to reach access for added convenience. The lightweight design allows convenient handling for user ease. Available styles are Lazer 600 Series Extended Reach Air Gun, Lazer 600 Series Safety Air Gun, and Lazer 650 Series Extended Reach Air Gun. Air usages (SCFM) are 8, 10, 13, and 15. PSI is 120. Noise outputs (DBA) are 100, 101, and 102. Thrusts (LBF) are 0.6, 0.9, and 1.1. Extensions range from 3 to 72. Dimensions vary per model. 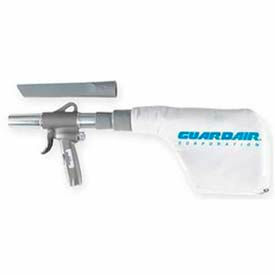 GuardAir Classic+™ Air Guns Provide High Pressure Air Maintenance For Applications Including Automotive, Commercial, Manufacturing, and more. 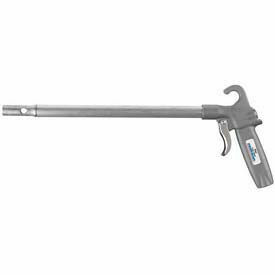 These air guns are designed for cleaning inaccessible and hard-to-reach areas for user convenience. The cast aluminum body ensures strength and durability for years of reliable service. The wide trigger provides added comfort for long term working environments. The hanging hook provides convenient, out of the way unit storage. Includes a precision air volume control for reduced work resonance. Available descriptions include Air Gun, Long John Safety Air Gun, Safety Air Gun, and more. Air usage (SCFM) ranges from 22 to 54. PSIs are 100, 120, and NA. Noise outputs (DBA) are 99, 102, 104, 108, and 109. Thrust (LBF) ranges from 0.2 to 2.8. Meets OSHA standards. Dimensions vary per model. GuardAir Syphon Series Air Guns Provide Air Pressure Maintenance For Automotive, Industrial, Manufacturing, and Other Related Applications. These air guns are designed for cleaning inaccessible and hard-to-reach areas for user convenience. The cast aluminum body ensures strength and durability for years of reliable service. The wide trigger provides added comfort for long term working environments. The hanging hook provides convenient, out of the way unit storage. Includes a precision air volume control for reduced work resonance. Available styles are Air Gun, Long John Safety Air Gun, Safety Air Gun, and more. Air usage (SCFM) ranges from 22 to 54. PSIs include 100, 120, and NA. Noise outputs (DBA) are 99, 102, 104, 108, and 109. Thrust (LBF) ranges from 0.2 to 2.8. Meets OSHA standards. Dimensions vary per model. GuardAir Accessories and Replacement Parts Enhance Operations In GuardAir Air Guns For Construction Industries and Repair Work. 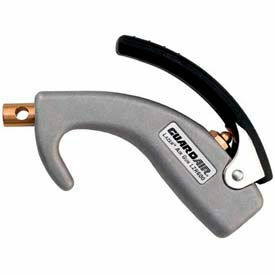 GuardAir accessories and replacement parts include extensions, cleaning tools, and more. Lightweight design offers simple storage and transport options. Select units come fully assembled. Additional specifications vary per model. 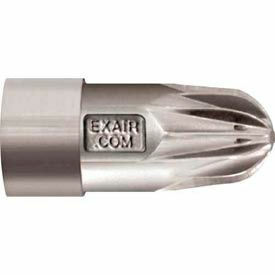 Exair Nozzles Are Designed For Parts Cleaning, Chip Removal, Material Conveying, and Other Related Applications. These air nozzles produce a high thrust, concentrated stream of high velocity airflow while minimizing air consumption and resonance levels. The compressed air is then ejected through holes located in recessed grooves that cannot be blocked or dead ended. 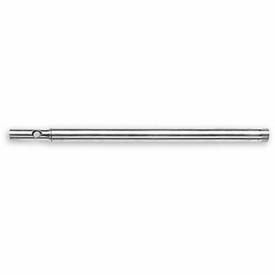 The stainless steel construction provides strength and durability for years of reliable service. Available types are Atomizing Spray Nozzles, Micro Air Nozzle, Mini Super Air Nozzle, Super Air Nozzle. CFMs range from .9 - 1.7 to 460. Air inlet NPTs range from 1/8" to M4 x 0.5. Male/Female thread Female, Female/Female, and Male. Diameters vary per model. Cejn® Compressed Air Blow Guns and Accessories Are Designed For Applications Involving Both Air and Non-Explosive Fluids. Cejn® compressed air blow guns provide safety conscious air pressured power to surfaces. Ergonomic handle offers comfortable grip control. Select blow guns offer standard full flow and pressure regulated safety for added user protection. Additional specifications vary per model. California Air Tools Spray Guns Are Designed For Maintenance Projects Including Automotive, Woodworking, and more. 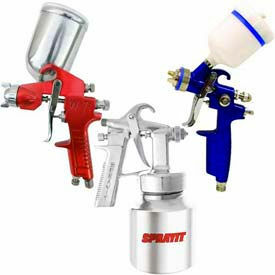 California air tools spray guns apply coating with air pressure force. Low pressure function offers added control with less overspray. 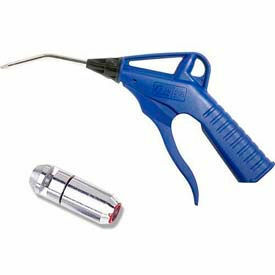 Aluminum body and corrosion resistant stainless steel fluid needle and nozzle provide lasting durability. Additional specifications vary per model. 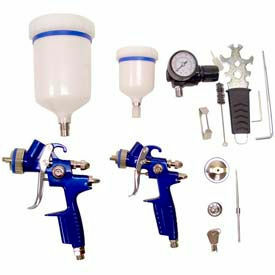 California Air Tool Spray Gun Kits and Accessories Are Designed For a Variety of Paint Spraying Applications. 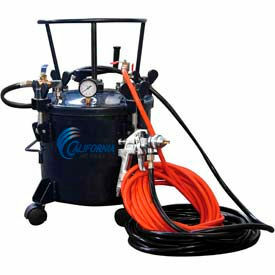 California air tool spray gun kits and accessories provide fast acting air pressure paint coatings. Compact, lightweight body offers ease of handling. Select models feature adjustable fluid fan pattern and air control for added precision and less waste. Additional specifications vary per model. Pressure Pots Are Designed For Various Large Scale Paint Spraying Applications. Pressure pots support mass spraying for automotive, woodworking, and other applications Wheel casters offer ease of transport from one worksite location to another. Select units reduce overspray and allow spraying larger surfaces in less time. Aluminum and stainless steel provides lasting durability. Additional specifications vary per model. GuardAir Nozzles Support Air Tool Accessories For Automotive, Manufacturing, Maintenance, and Other Related Applications. 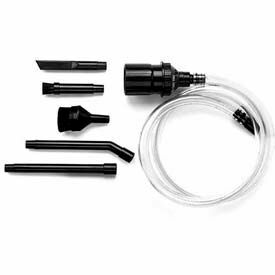 These nozzles are designed as a replacement tool for worn or damaged air gun accessories. The lightweight aluminum unit offers convenient, on demand cleaning power. Includes a threaded connection that screws into handle for easy replacement. Dimensions vary per model. 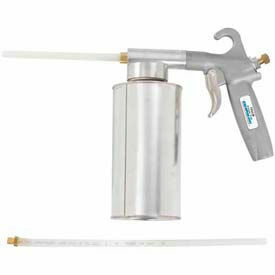 Eagle Air Spray Guns Are Designed For Automotive Finish Applications. Eagle air spray guns provide smooth and even applications of automotive finishes. Compact, lightweight design allows ease of use and transport from one worksite location to another. Stainless steel nozzle is corrosion resistant and offers lasting durability. Specifications vary per model. Blow Off Guns and Drying Systems Effectively Remove Debris, Dust, and more. Blow off guns and drying systems provide air pressure performance without the dangers of compressed air. Systems operate quietly and are safe to use, requiring less energy than high-pressure air compressors. Select units are wall mounted. Additional specifications vary per model. This long reach blow gun has it all. The 11" narrow, bent nozzle not only fits into tight spaces, it also comes with a side vent, making this product OSHA compliant. The pistol grip type body offers a molded comfort grip along with both an integrated hook as well as a hang hook for storage. The ¼" NPT brass air inlet offers a secure fit onto hoses. 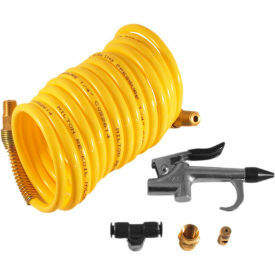 This blow gun offers a pressure range of 30 to 90 PSI and 16.5 SCFM.